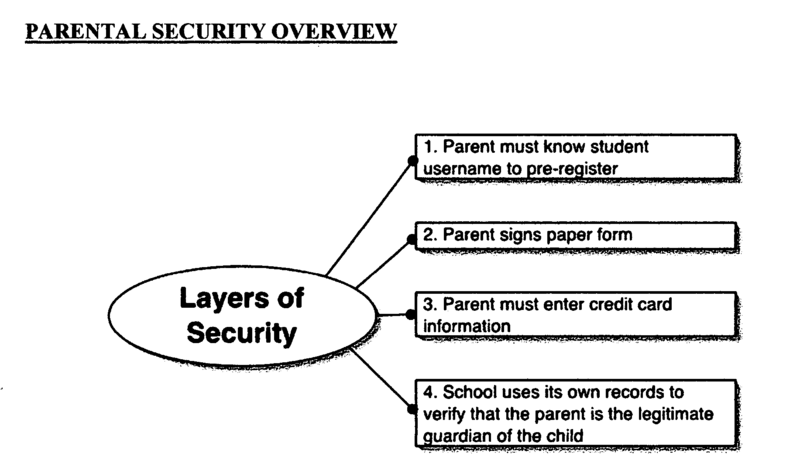 A method and system to permit the creation of “parent” accounts within a school system's data transmission system which are associated with the parent's child or children who are students in the system. A parent account is capable of creation and access by various levels within the hierarchy of the system and is associated with one or more schools within the community being serviced by the entity providing the servers and community generation implementation engine. Educators are also finding that without the participation of parents in the educational process, teaching is hampered and less effective. Parental involvement is critical on several levels. An involved parent is more likely to push their child to learn and go beyond the minimum requirements of a class session. An involved parent is also more likely to pay for the cost of the added benefit of technological integration into the classroom. However, parental involvement in education can also be seen by administrators and educators as another level of “bureaucracy” to which they have to answer, and which may sometimes become involved in petty matters. There is a need to enhance the educational experience by providing the interactive, connective technological tools for collaborative learning and involving those who ultimately are paying for the tools while, at the same time, preventing the parents from “micro-managing” their child's education or using the information high-way to inundate teachers and administrators. 1. An apparatus for parental community generation to permit monitoring and filtering data transmission to screen unwanted material comprising a parental community filter means to permit qualified parents to join a parental community, profile creation means to describe each qualified parent, a hierarchical infrastructure for initially screening parents to create a varying degrees of accessibility to data, a dynamic search engine to permit those members of the parental community to search the data initially screened within the limit permitted by the hierarchical infrastructure, a dynamic filter controlled by a central location to permit monitoring and filtering of the data transmitted and structuring of the infrastructure and a flagging filter component to scan messages and data prior to delivery. Humphrey et al. 2008 What does ‘inclusion’mean for pupils on the autistic spectrum in mainstream secondary schools? Newberry 2001 Raising Student Social Presence in Online Classes. Gunawardena et al. 2001 Critical analysis of models and methods used to evaluate online learning networks.